One of the joys of going away on holiday is the anticipation of exciting things to come, and one of the joys of being a professional artist is that this sort of thing is classified as ‘work.’ Whether you are professional or amateur you can still get a real kick in preparing for these exciting moments, and I do recommend that you give some consideration as to how you are going to tackle all this excitement with your methods, materials and choice of approach to the various subjects you have in mind. 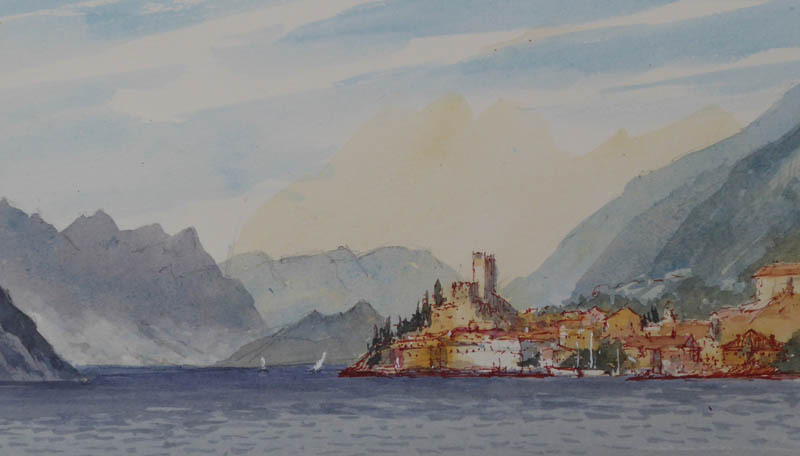 This alfresco watercolour of Malcesine on Lake Garda was a demonstration for a painting group. Before flying to Italy I had decided that I would be using pen and wash for some of the lake scenes and limiting my use of colours. For this scene I decided on a palette of cool blues – mainly cobalt blue, with warm colours concentrated on the main features and the centre of interest, ie, the town itself. The warm colours were mainly light red, cadmium red, yellow ochre and quinacridone gold. This approach really does make the buildings stand out. Because of the intense heat and the fact that I had to use Waterford hot pressed paper to accommodate the pen I had to work fast as the washes dried incredibly quickly. The smooth hot pressed paper tends to dry quicker than a not or rough surface. The pen I used was a fine-tipped sanguine colour to complement the warm-coloured buildings. I did not use it on the mountain features. This lends itself to creating a more unified result. I’m afraid the reproduction is not first-class as it was photographed by a camera and not scanned at home, but it does give you an idea of the sort of methods you can try out, and not just while you are on holiday, of course. It always pays to think out how you wish to tackle the type of subject matter you will encounter on holiday, and ensure that you have all the right materials to work with. This sketch of the back of the houses along the river in Beddgelert was done during our last painting course at Sygun Fawr Hotel. The initial outlines were drawn with a Sepia Pitt pen size S and then the watercolour washes were added. Some of the washes were done on the spot and I finished them off back in the hotel.David and I believe that the single most useful thing you can do to improve your painting is to take up sketching. Drawing and painting outdoors in front of your subject brings many benefits with it. Not only getting out and about in the fresh air, and having a little exercise if you are able to walk, but being in front of your subject instead of working only from a photograph means you are able to move around and get the best viewpoint, or sketch from several different angles to get any hidden details, and get closer to see details not apparent in a photograph.Photographs are not particularly good at capturing atmosphere and recession but when you are outside looking at a scene, half closing your eyes will reveal the tonal and colour differences between the distant and closer objects. Sketching in watercolour or pen and wash is a very quick way to capture colour and tone out of doors and it has the added benefit of loosening up your painting style. After all it is only a sketch and not intended for exhibition and because your time is limited it is not so easy to overwork it. 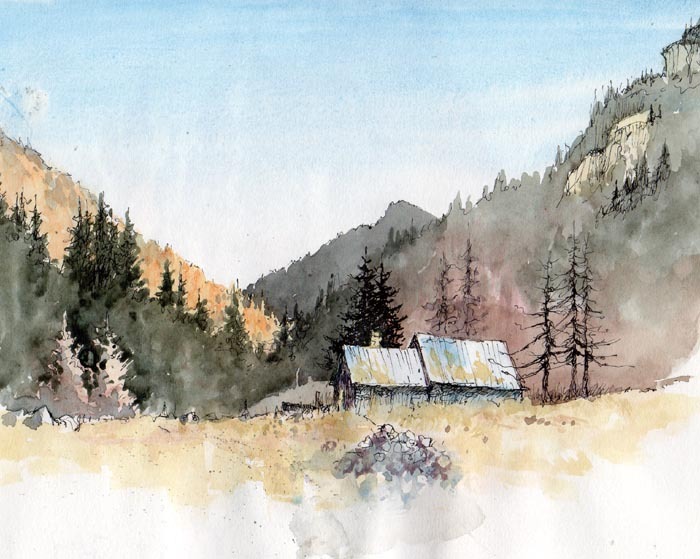 You can learn a lot from sketching in watercolour. Even if you are not particularly mobile, if it is possible for you to get out and enjoy nature, do try and do some sketching out of doors. I’m convinced you will find it improves your work.